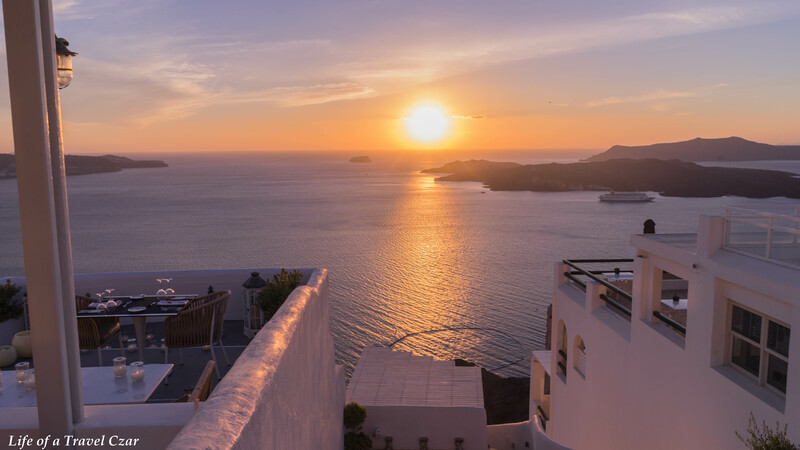 So the journey continues for me and I leave ole London town and head to the beautiful island of Santorini. 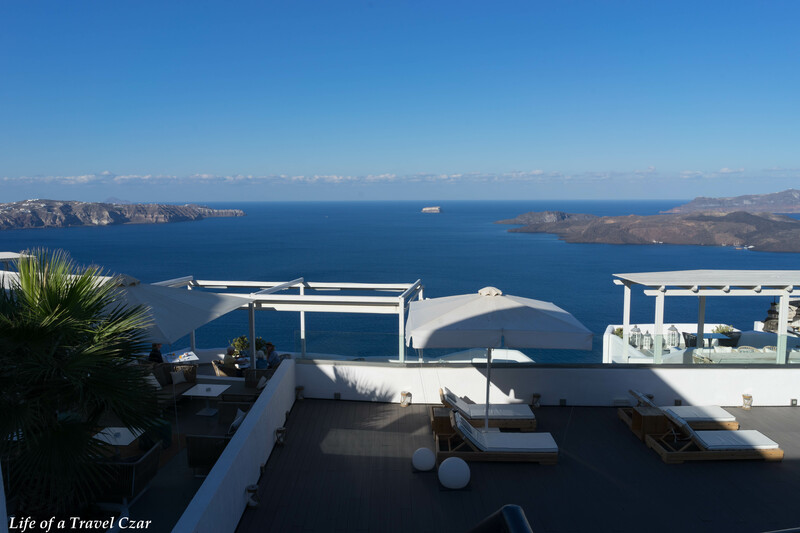 I am staying at the Azzurro Suites in Fira which is the capital of Santorini and where most of the locals hang. 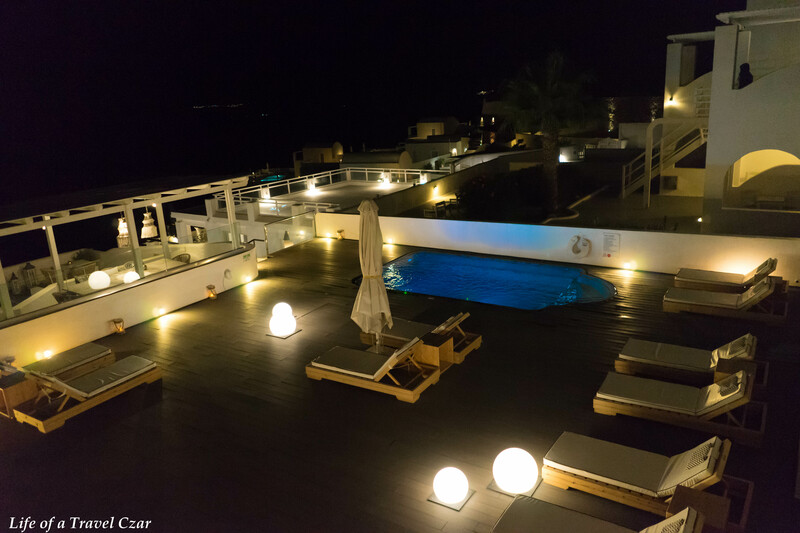 The hotel is relatively new and is built in a cave like architectural style – similar to most hotels on the island. 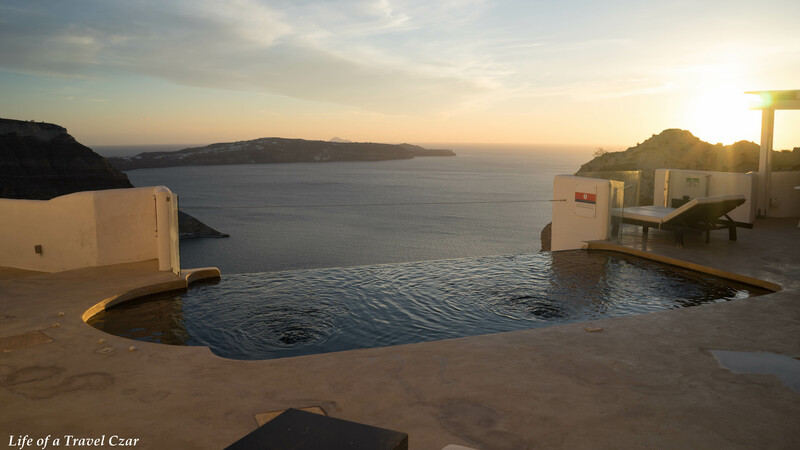 The hotel offers an unobstructed view of the Aegean Sea, the sunset, and Kameni island. The hotel only has 17 luxury suites which allows it to deliver a very personalised service to its guests. I arrive at the hotel and the view from the reception area is stunning. The deck on the top of the hotel (next to reception) has a pool with plenty of sunbeds for those wishing to waste away an entire afternoon. Here is a view of the deck at night. The background tune is You’re All I Have by Snow Patrol. I do not own the rights to the song. The room is super spacious with a very simple “chic” design. It has a comfortable bed, work desk, a wardrobe cupboard and large TV (which I never used). 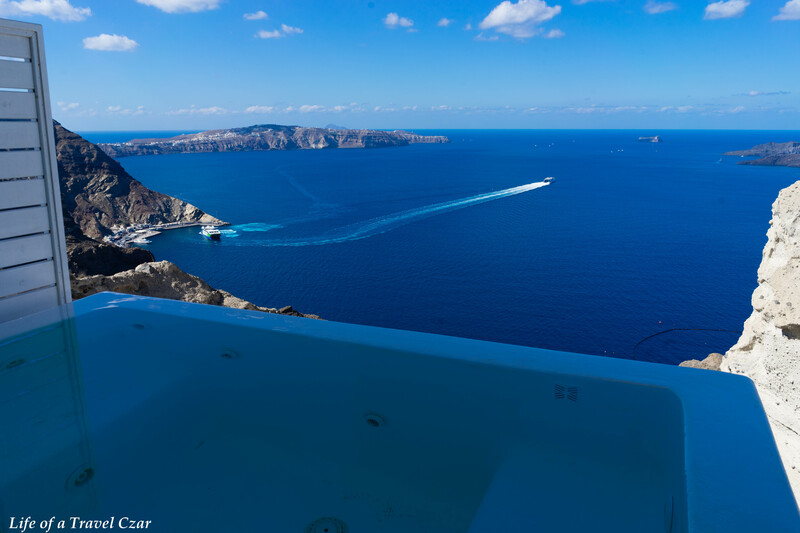 The highlight of the Suite (and where I spent of most my time) is the balcony which, as noted above, overlooks the caldera and has an infinity jacuzzi. 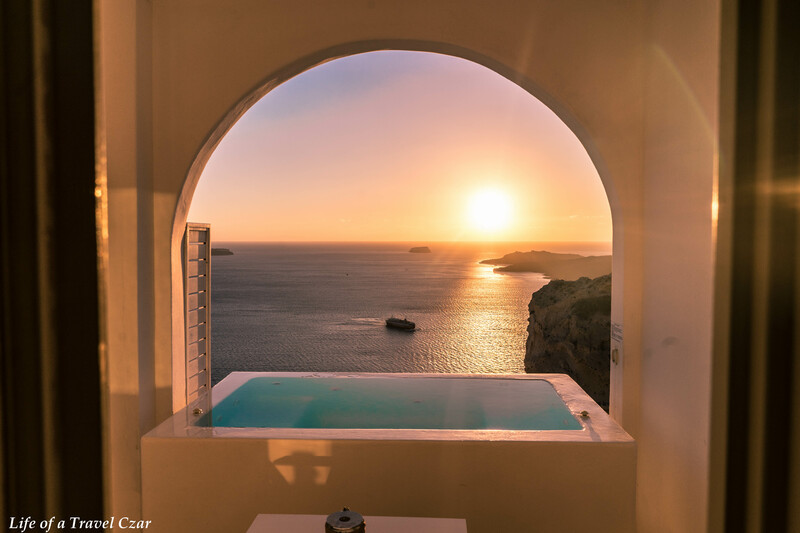 The jacuzzi is heated which is perfect for the nippy mornings and nights in Santorini. 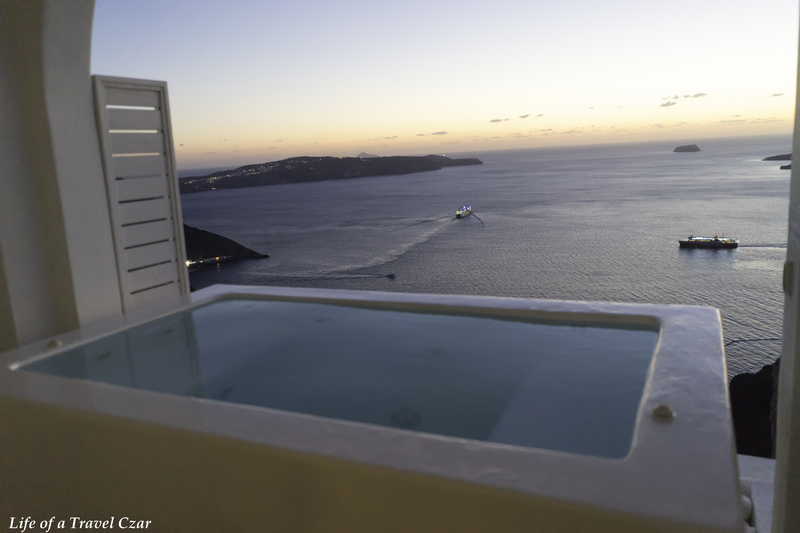 Here are some snaps of the jacuzzi and the view from the balcony. 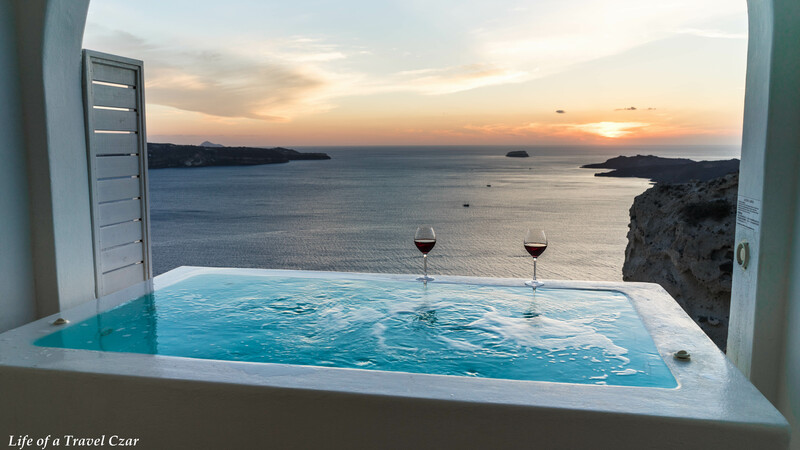 A welcome bottle of wine was provided and enjoyed chilled in the Jacuzzi as we gazed out into the beautiful Caldera. 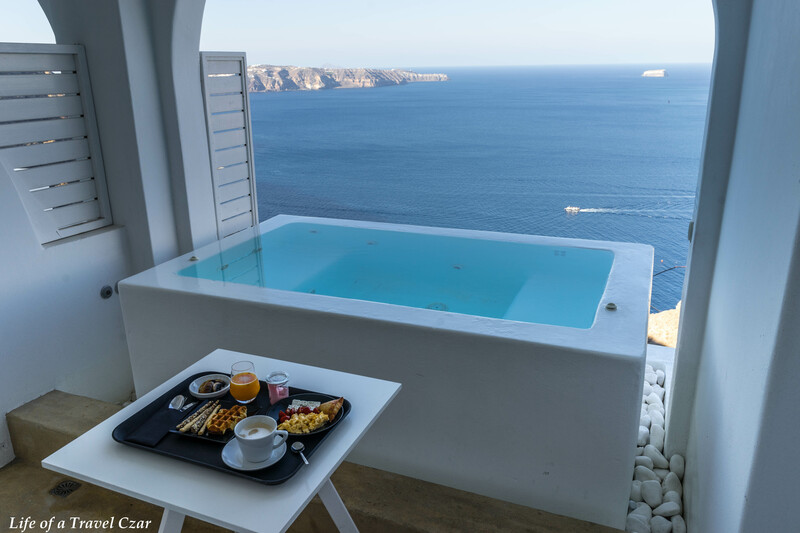 I have brekkie in our suite and there is nothing quite as lovely as tucking into some lovely golden buttery scrambled eggs, then dipping into the jacuzzi and casting an idyllic gaze across the blue waters of the Aegean Sea and the rocky terrain of the volcanic formations. The view is just indescribable! On a personal note, it was such a salient reminder of Psalm 95:4-5. It is just a moment that just remains etched in your memory forever. It was one of the few times in my life where I actually looked forward to an early morning start! 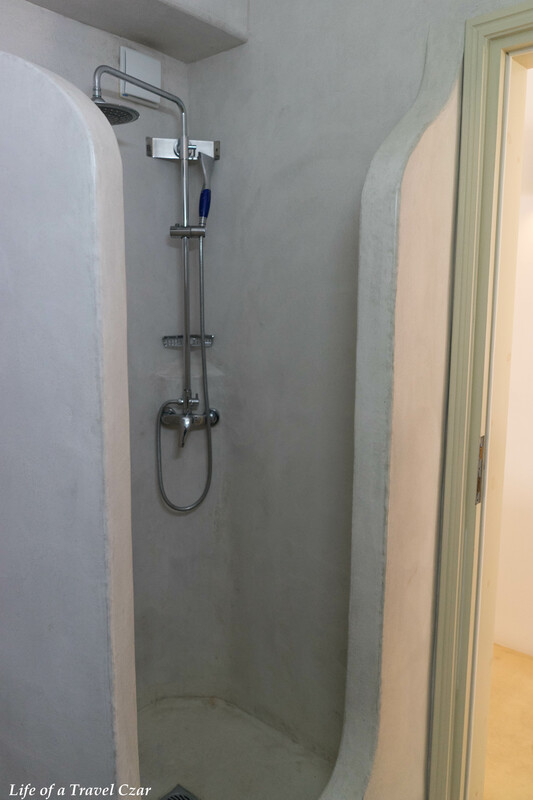 The bathroom has a smooth stone façade which gives you the feeling that you’re showering in a cave. 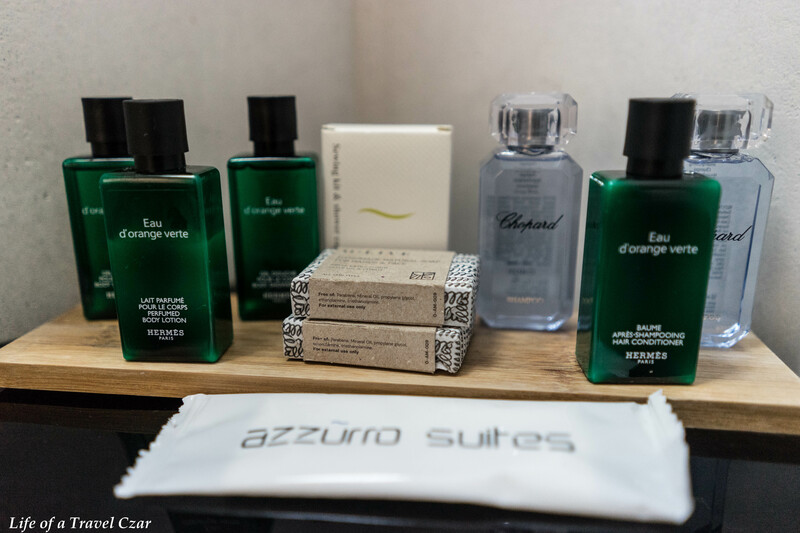 The hotel provides luxe amenities from Hermes and Chopard which are just oh so lovely. There are two pools at the hotel. 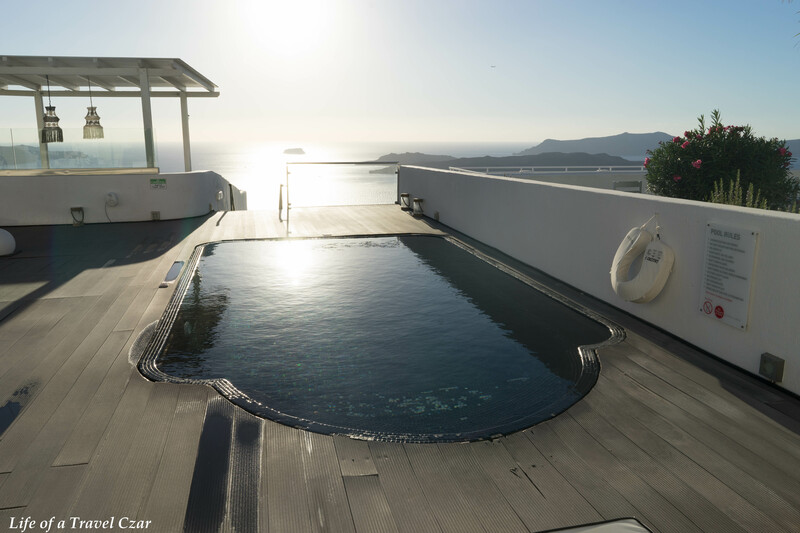 The pool on the deck is as you would have seen above and an infinity pool on the lower level which is literally on the edge of the cliff. This is not like other pools which look infinity-esque but are well back from the cliff, in fact there is a warning sign in this pool not to go past the edge as one would meet with an unfortunate end if they did! I take a swim and almost drop my phone in the pool, but the view from the pool is simply breathtaking. 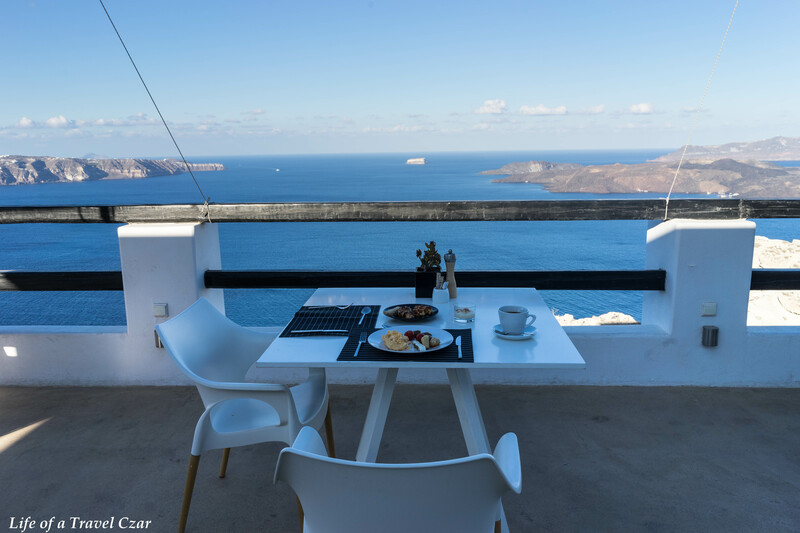 For breakfast you have two options; you can either enjoy a buffet breakfast in the restaurant which is perched high above the Caldera with stunning views (as I did on my first morning) or enjoy a selection of breakfast dishes in the privacy of your Suite (which I did for the rest of my stay). If you choose the latter you do need to place an order with reception the night before. 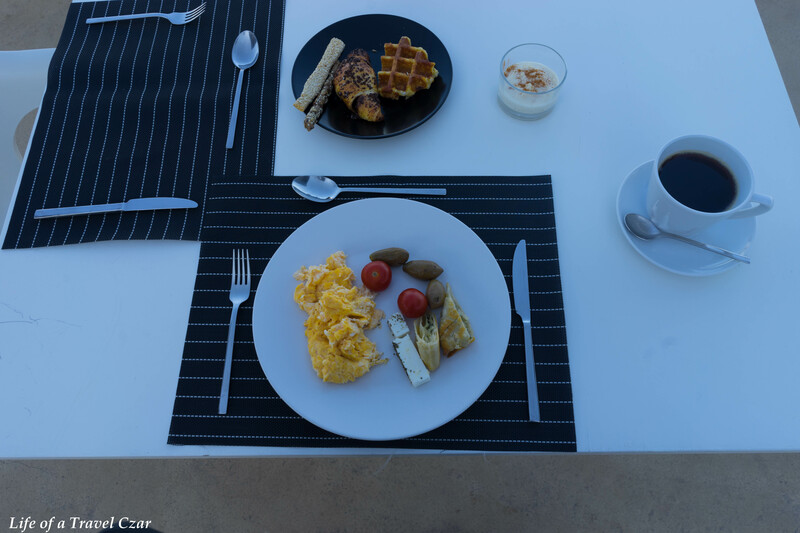 Here are my snaps of breakfast in the restaurant on my first night. 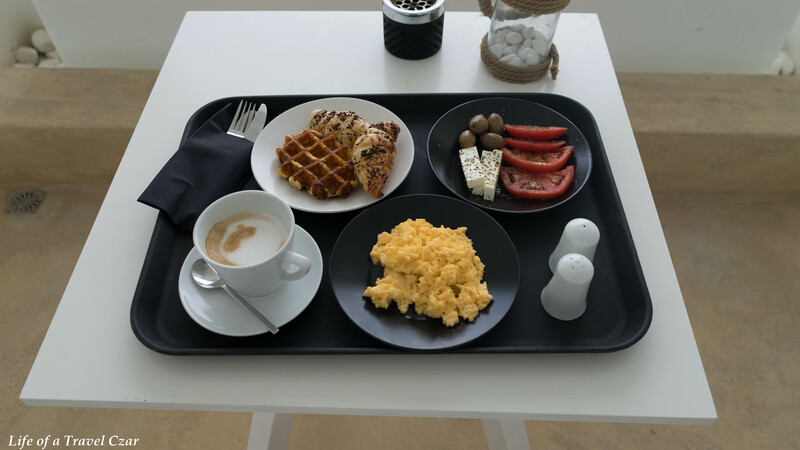 I recommend having breakfast from the restaurant on the first day you’re in town – that way you get to check out everything in the buffet and can make an informed the selection for your breakfast in bed for future mornings at the hotel. 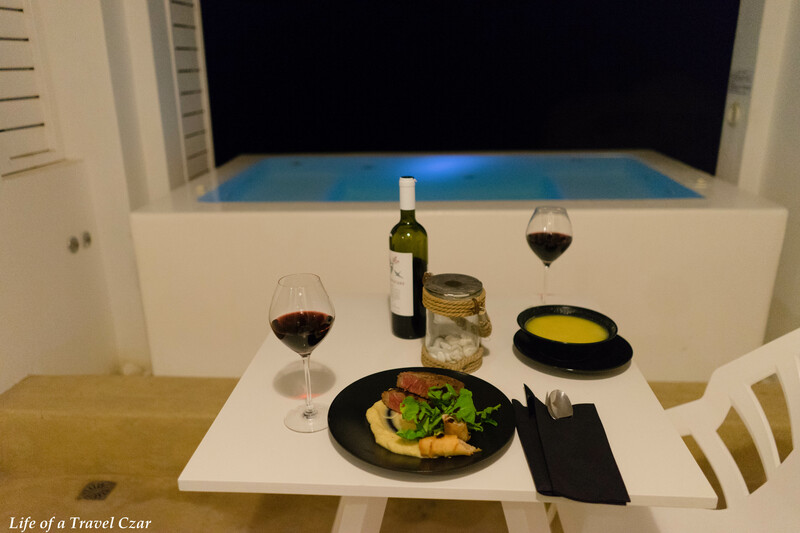 The hotel has a restaurant which is quite minimalistic in its approach. The restaurant / bar does not do cocktails, so you will need to head into town for those and they do close between 3pm and 8pm, so early diners need to go into town for dinner. 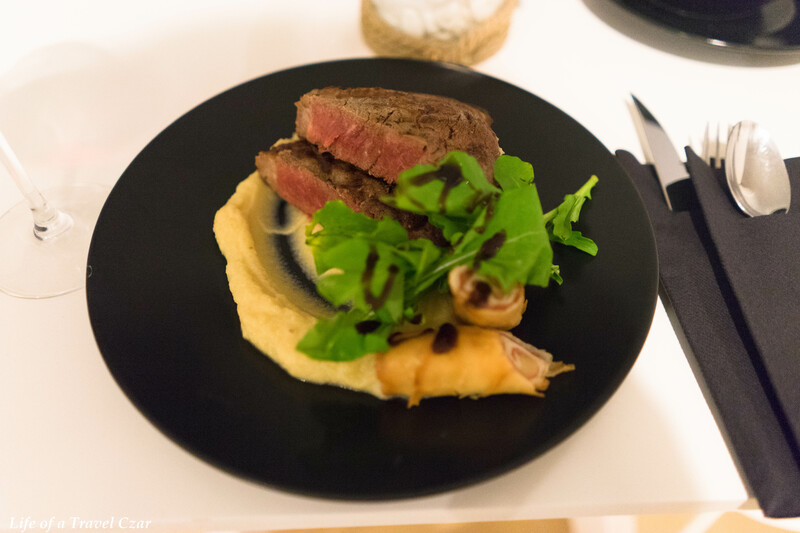 The restaurant offers room service for those wishing to dine in the comfort of their suites. 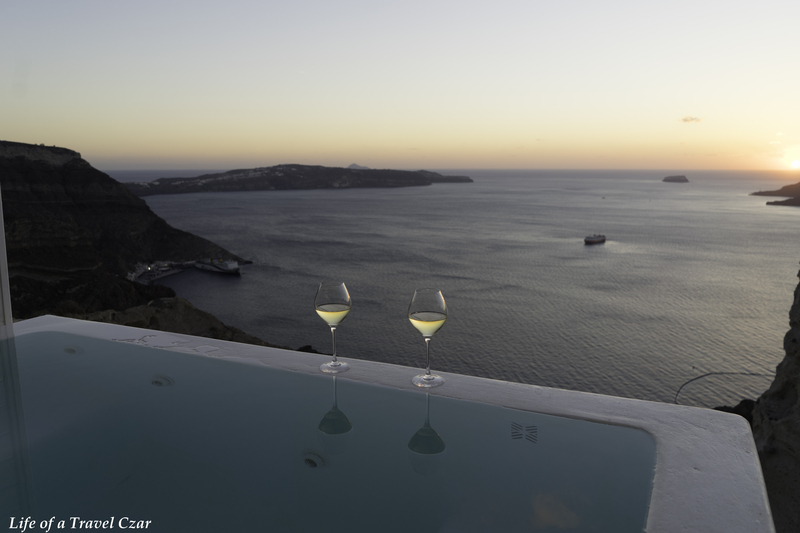 We did order dinner on my first night as I was lazy to head into Fira town to pair with a beautiful bottle of red wine. The selection of food available from the restaurant is quite reasonable. We have a good steak and fish soup which was ticked the boxes of most reasonable culinary establishments. The service in the hotel is second to none, the staff are always friendly, taxis are booked whenever you need them, recommendations on where to go are provided on entry and stay went through without a hitch. I did thoroughly enjoy my stay and the pictures kinda tell the story don’t they. There is a famous saying “Life is not measured by the number of breaths we take but by the moments that take our breath away.” My stay at this hotel was definitely one of those moments. 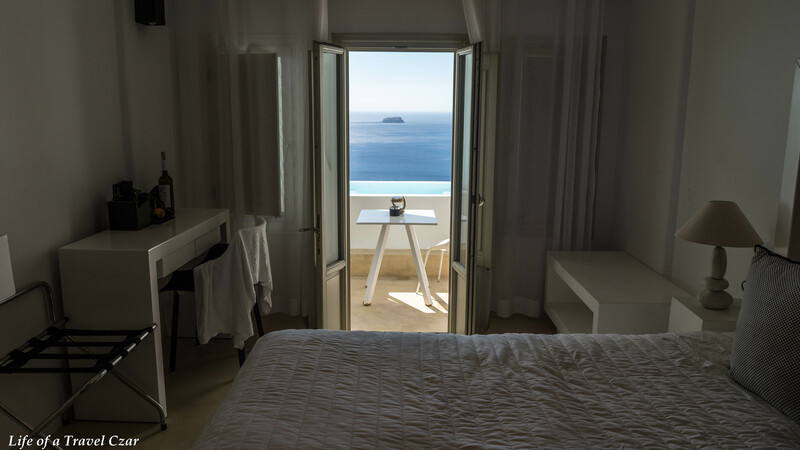 If you are keen to hear more about amazing travel experiences, like Azzurro Suites, the best way to keep in touch is to subscribe to the blog by clicking the on the form (link here). I promise not to spam you or sell your details; you will just receive updates about new posts on the blog and exclusive members only content. This was a beautiful post. You take amazing photos.